The Union has been in frequent contact with both the Minister’s office and senior officers of the department to resolve the non-payment of higher duties to teachers performing higher duties over the winter school vacation period this year, if the teacher had been performing these duties for less than 12 months. The QTU’s view was and will continue to be that our members cannot be expected to carry out the duties of a position (be it principal, deputy principal or head of program) if they are not being paid the appropriate rate for that position, and the Union was determined to resolve the issue before the next school vacation period. 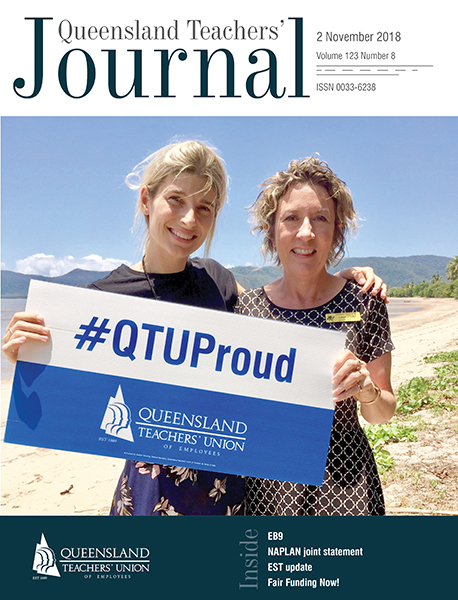 On 19 September, the QTU received a letter from Tony Cook, Director-General, regarding the payment of higher duties to employees acting in head of program or school leader positions during school vacation periods. The letter outlined that he had approved the payment of higher duties to relieving teachers appointed to perform higher duties over school vacation periods to the extent that the school vacation period falls within the relieving period. Provisions of the Ministerial Directive will apply to annual leave where appropriate. The Director-General also noted that backpay would be paid to employees who had undertaken higher duties during the 2018 winter vacation. The department’s payroll team commenced making the necessary payments and adjustments to employees who have undertaken, or will be undertaking, higher duties during the 2018 winter and spring vacations over the pays scheduled for 26 September and 10 October. The QTU has played a pivotal role in resolving these issues around higher duties and we have tirelessly sought this resolution throughout term three. It should be noted that, through QTU advocacy, at the end of 2017 we were successful in achieving payment of annual leave at the higher duties rate for the first four weeks of the summer vacation and having this backdated for two years. We now have a certainty around payment over mid-year vacations and been successful in ensuring it is backdated over the winter vacation period. This win means that all teachers performing higher duties (whether as a head of program, deputy principal or principal) will receive higher duties during mid-year vacations and the annual component of the summer vacations (if acting immediately prior to the summer vacation). Members with any queries about higher duties can email qtu@qtu.asn.au or call QTAD on 1300 117 823.